We can say the same prayer since childhood, grow so accustomed to its rhythm that we can't hear the words anymore, until one day, it's like a certain phrase is glowing with a message meant just for us. 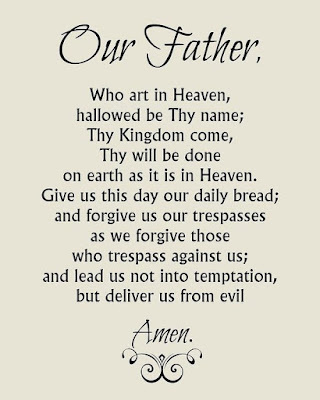 Today, that message for me is in one of the simplest prayers, the Our Father. The line that glows for me today? We don't pray "Give us this day our weekly bread" or "Give us this day all our future bread we will ever need and then some" or "Give us a different bread, please." Nope, just give us whatever we need to get through this day. That's where trust and faith intersect - we have faith that God will give us what we need today, and we trust that He will continue to give us our daily grace-bread in the future. It's easy to be able to look back on the past and see God's graces poured out, but for some reason it's still hard to know the deliveries won't stop coming. I think most moms are natural worriers, as we have a lot of souls in our temporary care. Isn't it nice to know that the God who created those souls loves them even more than we do, and promises to provide for their needs? Sometimes I see people struggling with a sense of purpose, or a career choice, discerning a vocation, or what they should be doing with their life. I think I would easily fall into this myself, except that doing what I have to do each day doesn't leave me with much time to think about what I want to do. Ha! God gives me my daily bread, and I just try to get through each day and onto the next. I know that sounds boring or maybe a bit depressing, but it's not. I'm happy to have this stage planned out right now. It's pretty easy for me to see I am living out my vocation, and I can save myself a lot of anxiety there. Could I do it better? Always! Oh this is such a good reminder. We are in a period of struggle right now, nothing serious as in life threatening, but just emotionally draining. And I am just praying my way out of it because that's all I've got left. Novenas and rosaries and know that God has it. But one day at a time is a true reminder for me. I am still trying at my age to learn the "one day at a time" thing. I am such a worrier and feel like I still struggle with a sense of purpose. I've gone through a dysfunctional childhood and dysfunctional 20s and 30s. It's only since I've reverted back to the Catholic Church in 2011 that I now and truly sense God in my life every day and for that I am most thankful and grateful.